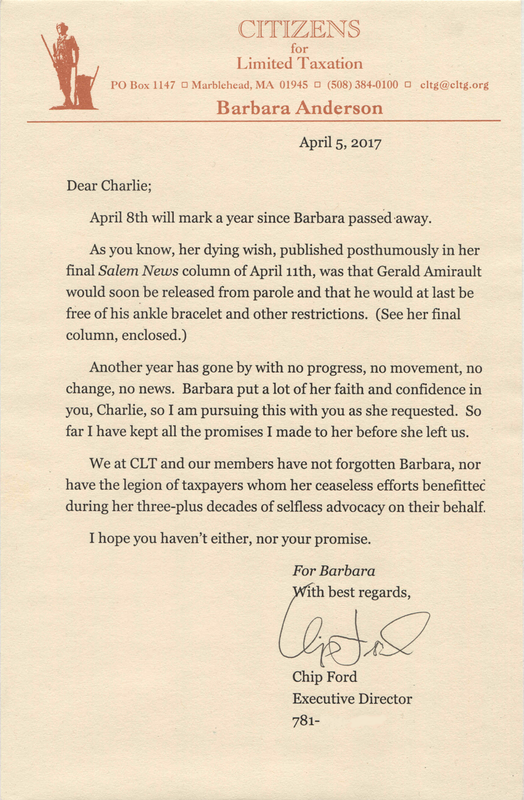 The reminder note below was sent to Governor Baker at his home on April 5, in memory of Barbara Anderson and her dying wish. Three weeks have passed and so far we have received no response, nor has the Amirault family. "There will be no memorial service but if anyone wants to honor my memory, please remind Gov. Charlie Baker that when he was running for office, he promised my friend Gerald Amirault and his family that getting Gerald off parole and his ankle bracelet would be a first order of business. So far he has broken his promise, and keeping it is my dying wish." Another year has passed and the deafening silence continues. Will Gov. Baker allow this decades-old travesty of justice to live on and Barbara's dying wish to die with her? Is he no more than a modern-day version of Pontius Pilate washing his hands of political courage: "I am innocent of the blood of this just person: see ye to it"?